The gold section of this weekend’s report. Now that gold has broken its daily cycle trend line I think we can assume that the daily cycle decline has probably begun. My best guess is that we will see gold drop into next week’s employment report and test the support zone and intermediate trend line between $1340-$1350. We knew this was coming, as gold will enter the timing band for a daily cycle low on Monday, so no one needs to freak out. That being said, daily cycle declines need to make traders freak out in order to reset sentiment and prepare for the next leg up. So I suspect what is going to happen is that the bulls will try to defend that $1400 level for a few days, followed by a very scary $30-$40 crash day that will bring gold back down to that support zone and a final daily cycle low possibly on the employment report or the following Monday. I don’t pay as much attention to the point and figure charts as I used to. I probably should as it spotted the daily cycle top at the declining trend line perfectly. I think we will break through that trend line during the next daily cycle. The bullish percent chart is also suggesting it’s time for a minor rest. It hasn’t reached levels indicative of an intermediate top yet (80%-90%), but the big surge off the bottom needs to pull back and consolidate before the next push higher. All in all, I think traders need to prepare for some whipsaw’s early next week as the bulls try to defend $1400, followed by a hard move down into the daily cycle low at the end of the week or the beginning of the next week. Once we put this daily cycle bottom behind us I think the next daily cycle will test the April stop run level at $1523. Then depending on what unfolds in the dollar we could very well see a fourth daily cycle higher that tests the QE 4 manipulation level at $1700-$1800. This entry was posted in Uncategorized on August 31, 2013 by Gary. This entry was posted in Uncategorized on August 30, 2013 by Gary. Let’s try this one again. It appears that the Syrian mess has stretched the daily cycle a little bit. 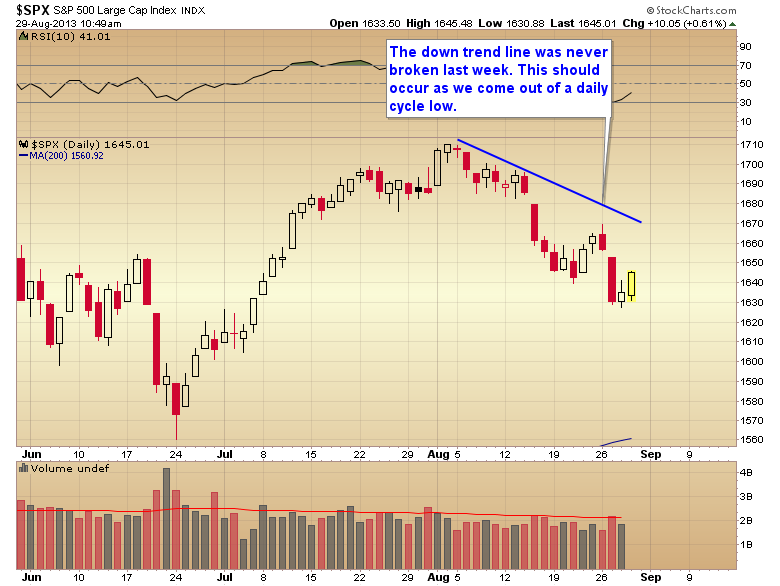 However the market never broke the downtrend line which would have signaled a final daily cycle low had been completed. So I think the cycle just stretched 5 extra days. We have another swing today, so another opportunity for the cycle to bottom. Stops should be right below yesterdays intraday low under the assumption that this will turn out to be the daily cycle bottom. I see many analysts assuming the bull market has ended. I really don’t think a 5 year bull market is going to give up that easy. At the very least I think we need to re-test the recent highs, and I’m expecting marginal new highs before this intermediate cycle rolls over later this fall. I do believe we are in the end game though. 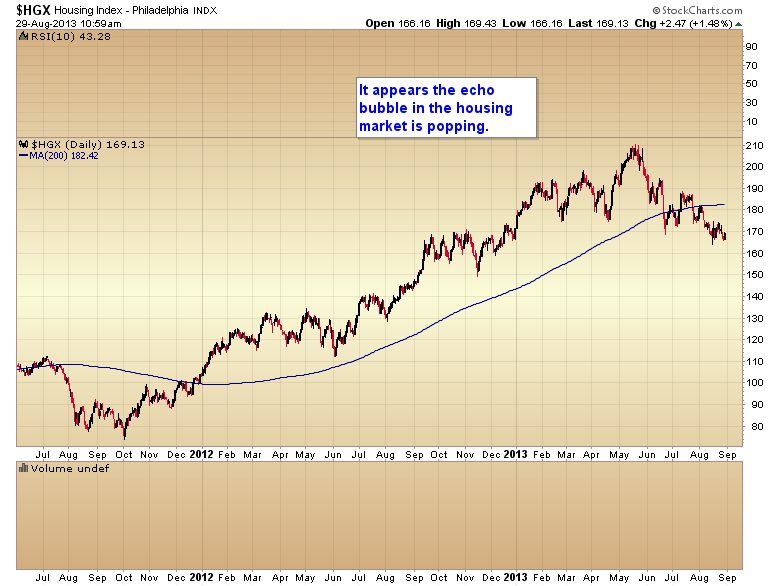 The housing sector and now maybe the financials are starting to roll over. This is usually how a bull tops, with the weakest sectors rolling over first followed by the rest of the market once the fundamentals are no longer deniable. I continue to believe we will get a final bull market top sometime this fall, to be followed by a multi-month volatile trading range as the Fed tries to reflate. All they will succeed in doing is inflating a spike in commodity prices. 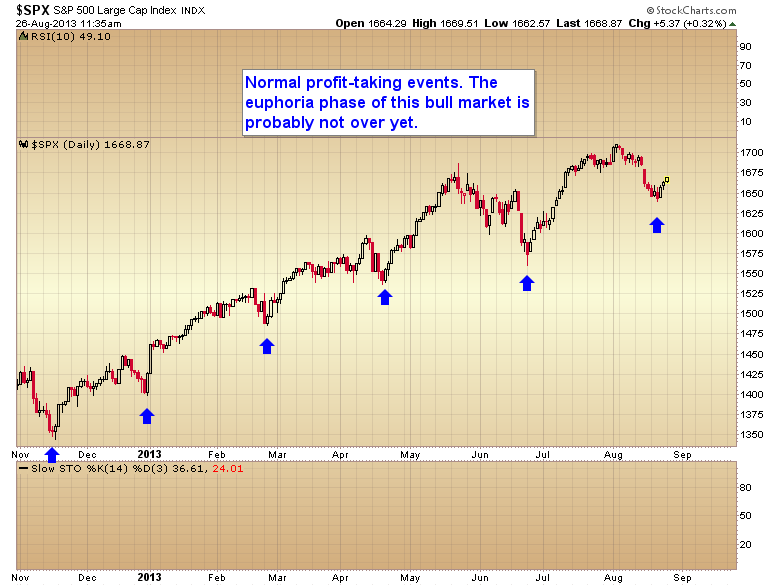 I expect the topping process to take the better part of a year with the real downside momentum starting in late 2014. This entry was posted in Uncategorized on August 29, 2013 by Gary. Up 500%. So far so good. This entry was posted in Uncategorized on August 27, 2013 by Gary. 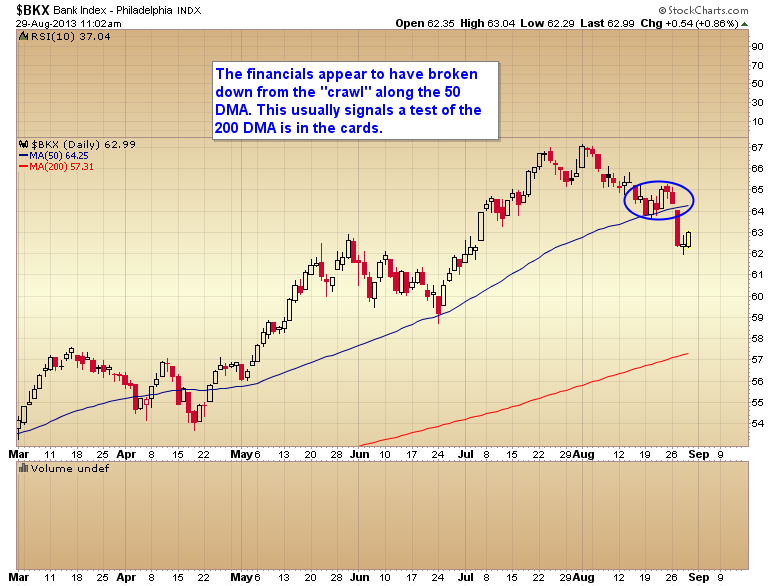 Many analysts lately have been calling for a top in the stock market. On the other hand I’ve been warning traders that what we experienced over the last three weeks was just a normal profit-taking event into a daily cycle low. These profit-taking events happen almost like clockwork every 35-45 days. I was expecting the bottom on either the retail sales or the Fed minutes last week. As it turns out the Fed minutes were the trigger to put in the bottom. I told subscribers in the weekend report that I thought the Fed would use this low volume last week of August to drive stocks back above the 1680 resistance level and set the market up for a rally at least into the next FOMC meeting and maybe much further if the Fed abstains from tapering. As I have noted many times in the past, traders rarely come back from summer vacation in the mood to fight the trend. I’m pretty sure the Fed is going to make sure the trend is up as we begin fall trading. On another note, I think the grains have confirmed a bottom along with the precious metals and energy. I believe the super spike in commodity prices that I have been expecting to begin this year and progressing into next year as the dollar puts in its three year cycle low has begun. Over the next month or two I expect everything to rise, with the exception of the dollar and bonds. Well after today it looks like we haven’t found that bottom just yet. This entry was posted in Uncategorized on August 26, 2013 by Gary. On June 28th I had a very strong suspicion that the bear raid and artificial bear market in the precious metals sector had come to an end. If I was right then one of the greatest opportunities in the last decade had just been created. I knew that if the move over the last eight months was not a natural move, that the fundamental supply and demand properties of the metals market had been severely damaged, and ultimately this would lead to an acceleration and intensification of the secular bull market. About a month ago I became convinced that I was right and that June 28th had marked a major bear market bottom. At that time I decided to start a project to see what was possible as the new bull market got underway. I started with $300 with the goal to try and turn it into $1200, a 300% gain. I reached that goal last week, and realized my sights were set way too low. Over the course of the next six months, using short-term option strategies, I think it’s possible to turn that $300 into $10,000, and depending on how aggressive and sustained the move is, I think $100,000 isn’t out of the range of possibilities. Options are always risky and there’s a strong possibility that I may get part way to the goal, miss a trade, and just end up losing the initial $300 stake. I’ll update the progress as I go along over the next six months. If I miss a trade and the position goes back to zero I’ll publish it and the quest will come to an end. This entry was posted in Uncategorized on August 25, 2013 by Gary. This entry was posted in Uncategorized on August 23, 2013 by Gary. This entry was posted in Uncategorized on August 22, 2013 by Gary. This entry was posted in Uncategorized on August 17, 2013 by Gary.